Check out the Email Verification Service industry’s most acclaimed competitors! These providers give customers the best experience in every measurable way! We are giving customers an impartial analysis of their products--we do not accept paid listings of any kind. We do not receive payment from any of the companies listed here. We don’t use any affiliate programs. Check out our method of analysis. This detailed list of top-notch email verifier services 2019 focuses on the accuracy level. Providers are ranked from best-in-class to generic, based on their performance. ZeroBounce gives its competitors run for their money; by its accurate email verification solutions. ZeroBounce has earned 23500+ active accounts with its data append facility at no extra cost and 24*7*365 dedicated customer support. Limited integration option with ESPs. The minimum order value is $40, which is on the higher side as compared to the industry. HuBuCo is the fastest email verification service; its verification system is capable of processing 3000 emails/minute. HuBuCo follows both American and European data protection principles.HuBuCo's servers are in the European Union. Also, HuBuCo has been growing in popularity with its accuracy as well as freemium offerings for validating email list with lower volume. Loyalty discounts for regular customers. Option to pay in 22 different currencies. 100 email verifications free every day. HuBuCo does not provide integration with ESPs. MyEmailVerifier is the recently launched email list cleaning service. It is one of the easiest email list validator one will come across. Right from the sign-up process to downloading the files, the entire email verification process is designed to be user-friendly. Excellent customer support via email. MyEmailVerifier does not charge credits for unknown and duplicate email accounts. MyEmailVerifier at present does not support integration with Email marketing services. MyEmailVerifier does not give detailed reports. QuickEmailVerification is a simple yet highly accurate email verification tool. QEV is designed to be user-friendly that offers a good option for integrating ESPs like MailChimp, AWeber, SparkPost to name a few. QuickEmailVerification's freemium model is what makes it ahead of the competition. 100 free email verification every day. Free tools like SPF analyzer, DKIM analyzer, DMARC analyzer, etc. are available for Webmasters. Live chat support not available. A physical address is not available on their website. DeBounce is the newcomer in the email verification industry committed to providing a 97.50% deliverability guarantee. 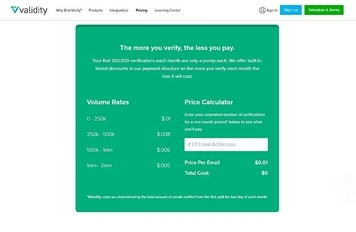 DeBounce is any user-friendly yet accurate email verifier. Free API for detecting disposable email address. Refund policy for lower deliverability results. Allows users to choose Validation server region upon request. API support available only in PHP language. 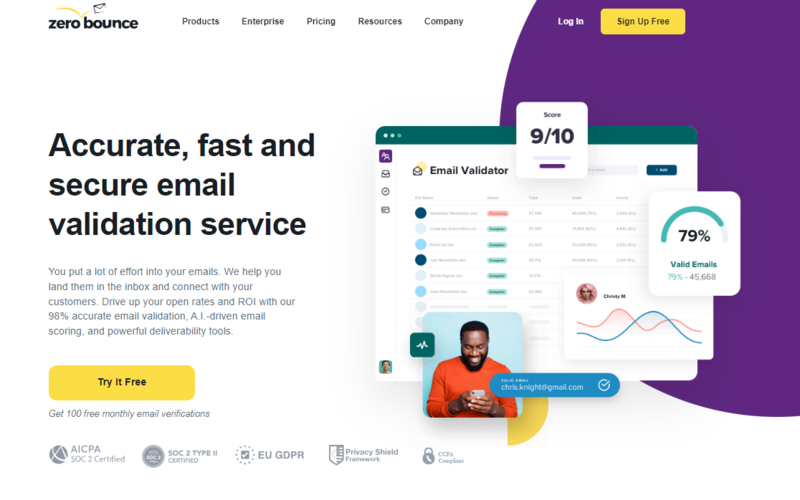 EmailListVerify has bagged some reputable clients like Rackspace, with its capability of handling and validating massive emails list efficiently. 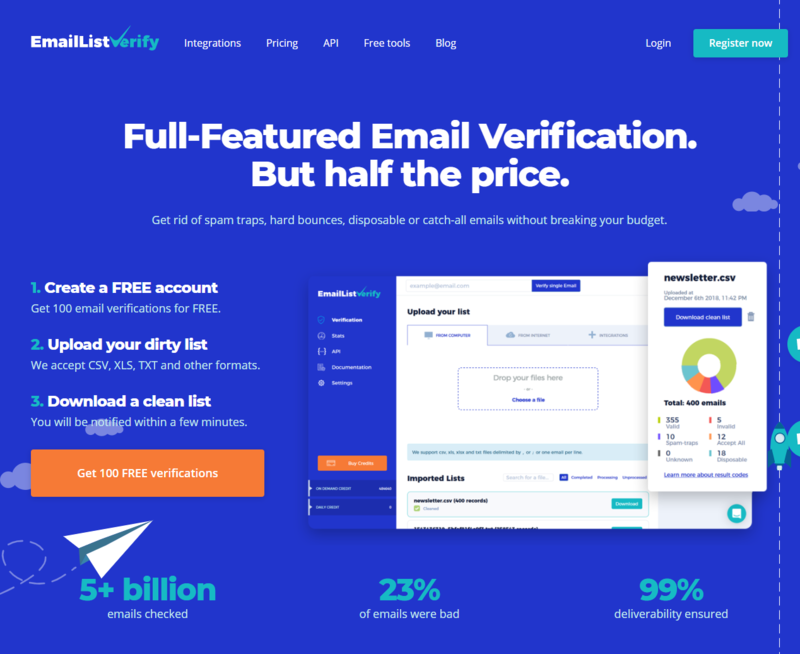 Apart from competitive pricing, EmailListVerify is a trusted email verification service. 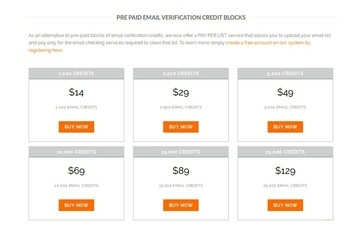 The minimum order value is only $4 for 1000 email credits. Free email verification offered for ten days. Customer support available only during business hours. BriteVerify is a trusted email verification provider, Fortune 50 companies from financial services, healthcare, Government agencies to Insurance companies take the services of Briteverify to ensure the quality of their customer data. Apart from email verification services BriteVerify offers various tools like Demand tools, People Import and dupe blocker. Britverify integrates with major ESPs, CRM and marketing platforms. BriteVerify does not remove duplicate emails from the list. Also the same is charged. Credit card details required for signing up. With more than 5000 clients across 153 countries, Bounceless works with big names like Disney, KPMG and Yamaha. Bounceless is a trusted email verification service with excellent accuracy level, 96.38%. However, with its premium pricing starting from a minimum $59, Bounceless is not affordable for smaller business. A good number of options for uploading the email list. Cloud services like Dropbox and Amazon are available for uploading the email list. Bounceless provides detailed insights into email list deliverability. 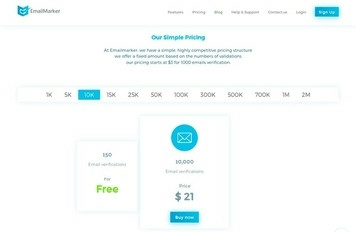 Minimum order value is $59 for 5000 email verification. With it's 24*7 easily accessible customer support and full refund policy for a dissatisfied customer, EmailMarker is highly customer-centric email verification service that one will ever come across. 24*7 Live chat, Email, and Phone support. Full refund policy for dissatisfied customers. Fewer option for downloading the resultant files. EmailChecker is compliant with all significant Email service providers like Gmail, Yahoo, and Hotmail. EmailChecker is amongst the handful of email verification services that is capable of validating Yahoo mail accounts accurately. However, EmailChecker lacks behind when it comes to integrating its services with ESPs like MailChimp. EmailChecker offers an “extreme” Yahoo (and Ymail) option in their Real-Time API for the best possible accuracy. Pay per list option available. Multiple lists can be verified at once, i.e. 20 email list(s). EmailChecker offers only 50 free credits. EmailChecker lacks behind regarding Email service provider integration(s). Do you currently employ an email verification service provider that is shown above? If so, we need to hear from you! Please share your experience with us regarding any of the above companies. Email verification is the prerequisite for a successful email marketing efforts. For a small or growing business, it might sound difficult to set out different budgets for bulk email verification as well as email marketing. Fortunately, email verification services offer free email verification that can be used for validating email lists with fewer records. Below listed are the best free email verification services offering email credits on the daily, monthly and one-time basis. Credit card required for free trial? Get great insight and intelligence.